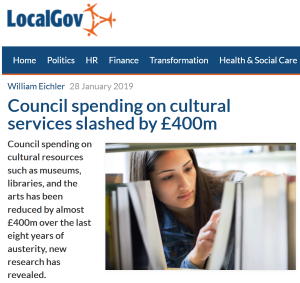 Council spending on cultural resources such as museums, libraries, and the arts has been reduced by almost £400m over the last eight years of austerity, new research by the County Councils Network (CCN) has revealed. An analysis of council spending by the County Councils Network (CCN) has found that metropolitan borough councils have reduced their culture spend by £104m – or 28% – since 2011, with London scaling back by £75m in the same period. CCN’s research also discovered that non-county unitary authorities have reduced expenditure on culture by £41m over the last eight years. District councils have reduced their culture spend by £3.1m. However, CCN found that residents in county areas have seen the heaviest reductions in spending on museums, galleries, libraries, and the local arts.